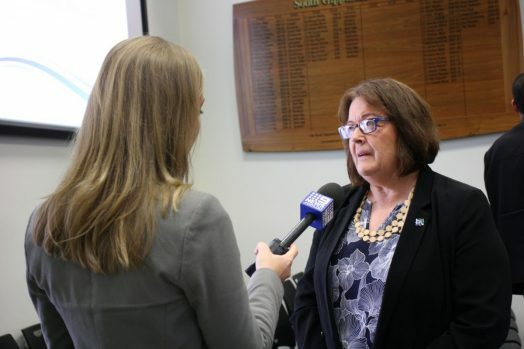 • Money matters: Mayor, Cr Lorraine Brunt answers questions from Nine News’ Izabella Staskowski after a public briefing session last Wednesday on Council’s financial position. THERE was a clear message coming out of South Gippsland Shire Council’s public briefing session last Wednesday: despite reports to the contrary, Council is “not swimming in cash”. Council’s Manager Finance Tracey Luddup made a presentation on the ‘Annual Budget – End of Year Financials 2017/18’, outlining the state of SGSC’s financial position. “Our paramount goal must be striding for that long-term financial sustainability. It sets us up for the future and ensure we can continue to provide the services we are currently providing,” Ms Luddup said. “Council achieved an operating surplus of $7.5 million in 2017/18. And it’s important to note that in that $7.5 million, there was $4 million from the Victorian Grants Commission. Ms Luddup said that surplus was projected to drop to $1.38 million in 18/19, with the anticipation of half as much from the grants commission in that period. Ms Ludduup said there was a high level of debt 14 or 15 years ago, but now Council was looking to become debt free in 2019 – 2020. Mayor, Cr Lorraine Brunt said having a list of priority projects meant “we do have to accumulate a bit of money there, just in case we do get funding”. “We do need to have that bank of money and we do have $1.3 million and if you actually put that into coins you could actually swim in it,” she said in jest. The topic of Council’s apparent wealth has been a hot topic in recent times, with some ratepayers arguing that more of Council’s surplus should go back to ratepayers. It’s a point of view that has been championed by Cr Don Hill, Cr Andrew McEwen and Cr Jeremy Rich. “In 2003/4 this Council had $14 million in loans, is that correct?” Cr Brunt asked Ms Luddup. “Just after that we saw an 18 per cent rate rise, which basically had a doubling effect on what people were paying at the time,” Cr Brunt said. Cr Brunt said surpluses were sometimes needed for “Black Swan” events. “We’re certainly not holding slush funds or anything like that. The days of having large provision set aside just don’t exist anymore. The accounting firms don’t allow it even if we had the philosophy,” Ms Luddup said.